Okay, you’ve located a couple of possible lessons and you want to be sure they are good quality STEM lessons. First and foremost, the lessons need to be shaped by STEM principles and criteria. Let’s do a walk-through of a couple of lessons, using Design Tool 5.1: STEM Lesson Specifications, and I’ll show you how I think about this. Of course, you are free to develop your own way of thinking! 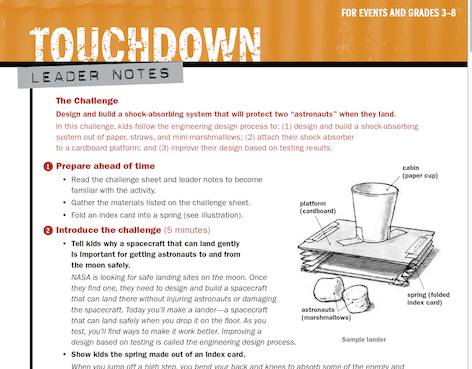 Lesson Example 1: Touchdown on the Moon — Now let’s use the specifications to check out an actual online lesson called “Touchdown” that you can locate on one of my favorite sites—the PBS Kids Design Squad. To make this easy, here is the link to a PDF that contains both the teaching guide (Leader Notes) and the student lesson handout (http//bit.ly/1RStUhE). Compare the teacher and student PDFs and then spend a few minutes reviewing the description of the lesson in the Leader Notes version. Once you have a good grasp of the lesson plan, use my STEM Lesson Selection Criteria (above) to evaluate the lesson according to each specification. I’d suggest you do your own evaluation before reading my analysis. Here’s my personal take on this lesson, which I consider a really cool idea—especially for a space unit. Your take might be different, and that’s okay. For Specifications 1, 2, and 3 I give this lesson a thumbs up (“Yes” rating). The problem is real, compelling, and students can relate to it. There are multiple acceptable solutions that they could design. I might make a couple of adaptions based on the 8th graders I taught. I’d add a few more soft or springy materials from which they can choose and experiment. One other thing: I’d avoid giving students information about how the materials might be used to create shock absorbers except on an as-needed basis. Make them think! I’d simply give teams the materials and let team members muck about with them to invent ways to use them as shock absorbers. (They’ll figure it out.) I would not fold an index card into a spring to show students how to make a shock absorber, for example. If a team is completely stuck or off track, you may need to give them some hints and idea starters, of course. For Specification 4 I’d rate this lesson “Somewhat” on applying important science and math concepts. There’s not a lot of explicit focus on gradelevel content. Although you can find some curriculum connections at the end of the lesson, they are not made explicit to the students as the lesson is conducted. If you want to use this activity, first make sure it matches your science objectives (e.g. force and motion, potential and kinetic energy, Newton’s Laws). Also make sure any appropriate math objectives are included. Simple measurement is a given. Maybe students could create scatter plots or Cartesian graphs with the data. I’d also spend some time thinking about where to strengthen the curriculum connections within this STEM lesson. I’d certainly work with a math colleague to find out how to include a relevant math objective effectively and to be sure I am using the correct terminology. Best-case scenario: The math teacher handles the math connections in math class, if you both teach the same students. That way, the isolation of the two subjects breaks down. Next, I’d decide points in the lesson when students will identify how what they’ve learned about energy and other science/math concepts relates to the activity. I would probably teach the relevant science and math content prior to using this activity, and make direct content applications explicit during the activity. That means I’d need to develop some questions to guide their thinking. Anne Jolly’s complete analysis of the lesson, applying all of her specifications, can be found in Chapter 5 of STEM By Design (Routledge, 2017). All rights reserved. What’s So New or Different about STEM?